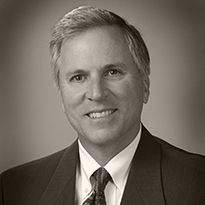 Russ began his insurance career in 1985 working for New England Life in Tulsa. During the early 90’s, Russ moved to an independent P&C agency where his focus became senior living facilities. In 1999, he moved his practice to Rich and Cartmill. After a brief period, he was offered an opportunity to join the ownership group and became one of the Vice-Presidents of the agency. As a shareholder, Russ has participated on the Executive Committee, chaired the building and growth committee, and served various other roles within the agency management group. Russ is a member of the Independent Insurance Agents of Oklahoma. He is also a charter member of NCHA (National Council of Healthcare Agents). This is a small group of insurance agents that specialize in senior living facilities. NCHA is widely recognized by most insurance companies as one of the most dynamic group of specialists in the industry. Collectively, NCHA agents and their respective agencies represent upwards of 20% of the senior living facilities across the U.S. In the State of Oklahoma, Russ belongs to OAHCP and Leading Age of Oklahoma. Russ is recognized by his peers in the State of Oklahoma as one of the few insurance experts in the senior living field. Through his many contacts in the senior living arena, he has helped create a senior living team of agents and CSR’s at Rich and Cartmill that provide insurance for over 300 facilities not only in Oklahoma, but in Arkansas, Missouri, Kansas and Colorado and Texas. In his spare time, Russ enjoys fishing, hunting, golfing and traveling. He and his wife enjoy being with their family which include their three children and three grand children.